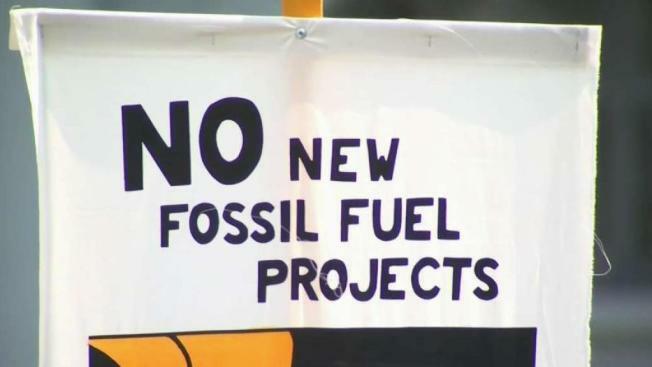 A projected 4,000 people will gather on Sept. 8 to call for no new fossil fuel projects. A Bay Area group said thousands of people will be marching toward the Civic Center Plaza in San Francisco and call for an end to "climate injustice." Sam Brock reports. Thousands of people are planning to march toward the Civic Center Plaza in San Francisco and call for an end to "climate injustice." A projected 4,000 people will gather on Sept. 8 to call for no new fossil fuel projects and a sea wall for San Francisco. If the crowd holds in the planned march, it has the potential to take over the streets as activists create urgency ahead of a global summit in the city the following week. The coalition of climate change advocates want to paint over current environmental policy and reinforce the fact that record fire seasons and rising sea waters are not happen chance. "There will be people from all over this state, covering all kinds of interests because this will be the largest climate march the west coast has ever seen," said Miya Yoshitani, executive director of the Asian Pacific Environmental Network. Activists worry climate inaction has already taken its toll. "As a frontline community, we already have had our health affected," said Tere Almaguer with PODER, a San Francisco-based environmental group. "We already have really high instances of asthma, cancer and heart disease." A new "FireLine" report from the insurance group Verisk puts 15 percent of all California homes at high or extreme risk, with Alameda one of the five most vulnerable counties in the state. The group used advanced remote sensing and digital mapping technology to determine the impact of three factors that contribute to wildfire risk: fuel, slope and access. Verisk said it could not identify what parts of Alameda County are most at-risk, but history tells us that the Oakland Hills are an obvious high-risk area. The other top five areas are red-flagged as "most vulnerable" are all in Southern California.